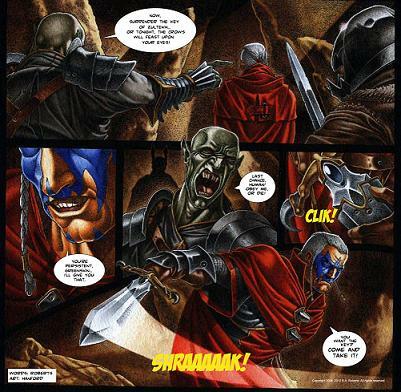 The barbarian warrior Caylen-Tor first appeared in the lyrics of the second Bal-Sagoth album back in 1996. This new novel length publication from DMR Books features three novellas detailing Caylen’s epic adventures and an extensive section of appendices. The book is available in three formats; trade paperback, classic sized paperback and digital. The Elizabethan privateer Caleb Blackthorne first appeared in the lyrics of the song “When Rides the Scion of the Storms” on the album “Battle Magic” in 1998. Now, his saga has been expanded into a trilogy of stories appearing in the “Swords of Steel” anthology series published by DMR Books. Volume I features the story “Into the Dawn of Storms”, volume II contains the second installment “A Voyage on Benighted Seas” and volume III includes the final episode of the trilogy “The Scion at the Gate of Eternity”. 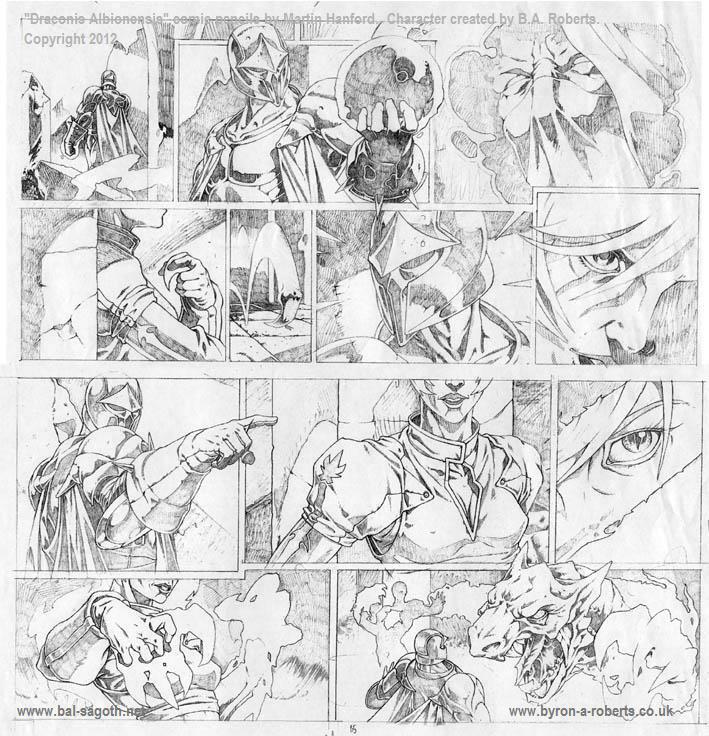 Below are preliminary sketches of the illustrations which accompanied the Caleb Blackthorne stories in the “Swords of Steel” series. Artwork by Martin Hanford. The grim and fearsome vampyre hunter Joachim Blokk first appeared on the album “Battle Magic” in 1998, in the song “Thwarted by the Dark (Blade of the Vampyre Hunter)”. Now, his pitiless quest for vengeance continues in the short story “Darkfall (Return of the Vampyre Hunter), published in the fantasy anthology “Devil’s Armory” from Barbwire Butterfly Books/Horrified Press. 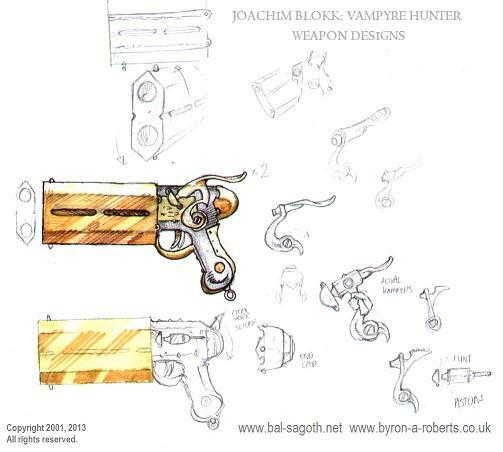 Below are illustrations of the Joachim Blokk saga logo and some concept art of his deadly firearms. The vampyre hunter will also be appearing in a series of comic strips soon. Illustrations by Martin Hanford. The epic saga of the Obsidian Crown first began on the album “Starfire Burning Upon the Ice-Veiled Throne of Ultima Thule” in 1996 and continued on the album “The Chthonic Chronicles” in 2006. Now, the expansive story of epic warfare and dark sorcery continues in the short story “Chronicles of the Obsidian Crown”, published in the anthology volume “Barbarian Crowns” from Barbwire Butterfly Books/Horrified Press. The saga will also continue in further short stories soon. Here are some preview elements of the comics written by Byron Roberts and illustrated by Martin Hanford. 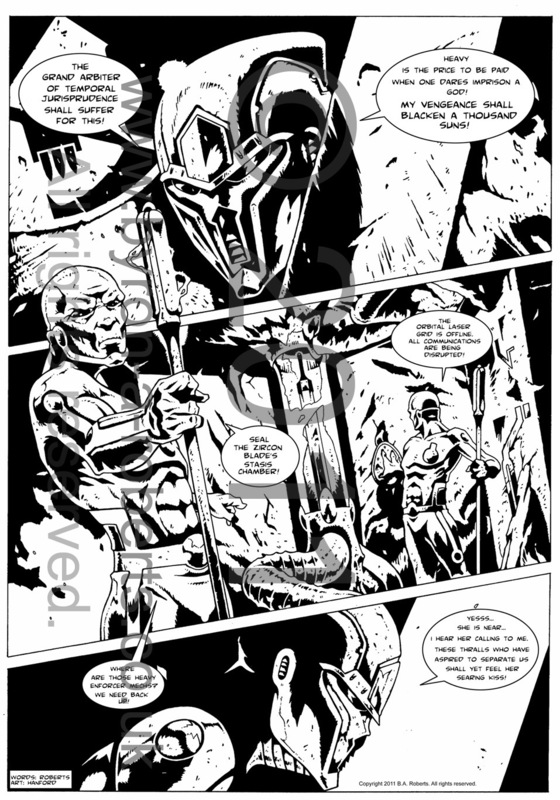 This page forms part of the “The Key of Zultekh” story arc, which is referenced in some of the forthcoming mini-comics. The story spans many millennia and involves several of my characters from the different eras of the Lexicon. A larger resolution scan of this page will be uploaded soon. The mini-comics will feature such characters as Joachim Blokk: Vampyre Hunter, Bright-Anya Ophidia, commander of the Draconis Albionensis, Lord Angsaar the Dark Liege of Chaos, Zurra: Hound of the Z’xulth, Caylen-Tor: Wolf of the North, Professor Caleb Blackthorne, and more. 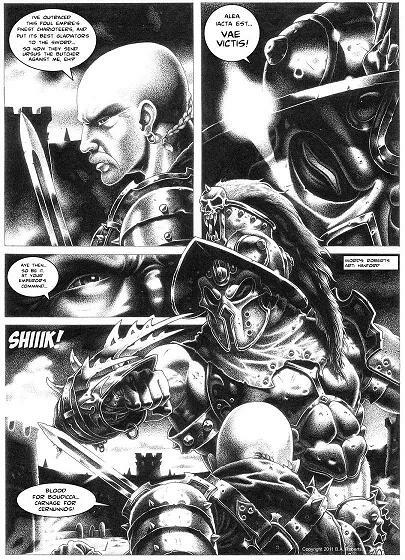 The following page is from a comic based on the events partially recounted in “Blood Slakes The Sand At The Circus Maximus.” The Iceni warrior has defeated Rome’s finest charioteers, slain ferocious beasts and engaged a multitude of gladiators. Next, he must face the undefeated giant known as Ursus the Butcher in another pitiless battle to the death. A larger version of this preview page will be uploaded soon. Here are the pencils for one of the pages of the “Draconis Albionensis” comic. Artwork by Martin Hanford. Here are previews of some of the logos from the mini-comics, rendered by Martin Hanford. First, here’s the Zurra logo. And here’s the logo for the comic featuring Joachim Blokk: Vampyre Hunter. Joachim Blokk wields a fearsome array of weaponry with which he dispatches his vampyric foes. Here are some concept designs for his specially customized firearms, including his deadly four barreled flintlock, which he uses to devastating effect in the prose story and the forthcoming comic strip. All artwork, characters, designs and logos copyright 1993, 2016 B.A. Roberts. All rights reserved.